So long, September. It was real. It was fun. But it’s about to get a whole lot more fun in October! 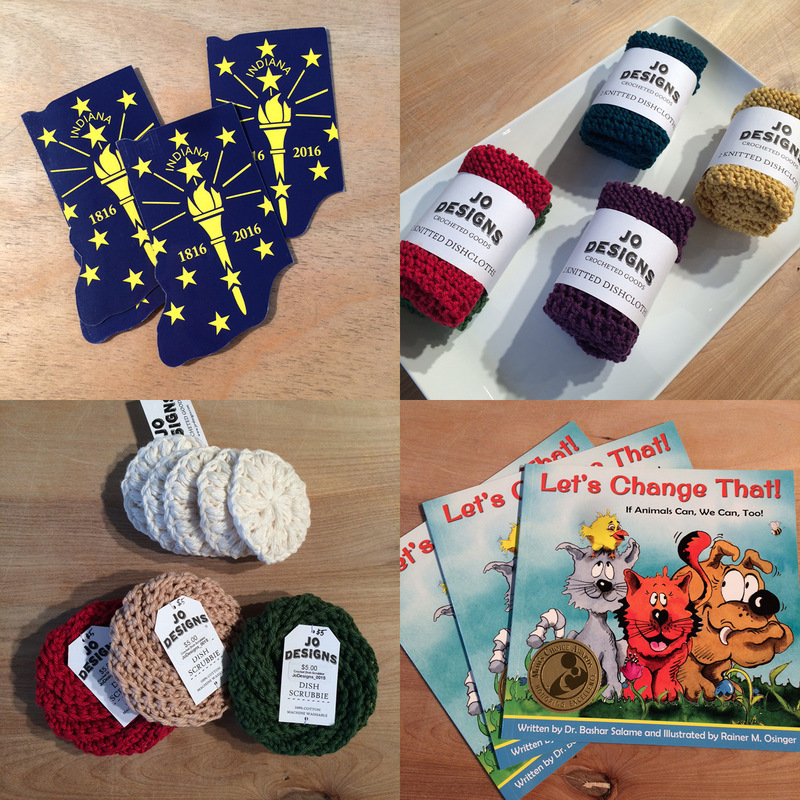 Make sure you read about all the great events coming up here at Homespun and in Indianapolis at the end of this post! New vendor Moko & Co. from Charlotte, NC brings us screen printed pouch goodness; brand new designs/ neighborhoods from Indygeneous including Old Northside, Woodruff Place, Bates-Hendricks, Fall Creek, and Irvington (these are folded cards but postcards and posters are also available); new fingerless gloves knitted by Die Schneiderin; and lovely Hoosier mugs by local Farizula Designs. 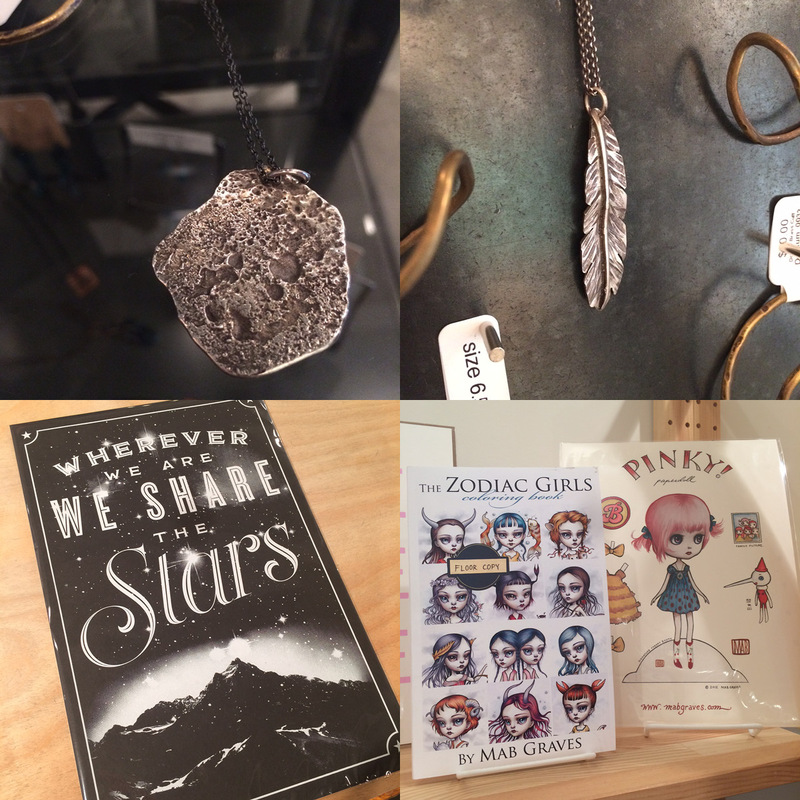 New Melt and Feather necklaces from Deesum Designs; Wherever We Are poster by Ronlewhorn; and new Zodiac Girls coloring book by artist Mab Graves. 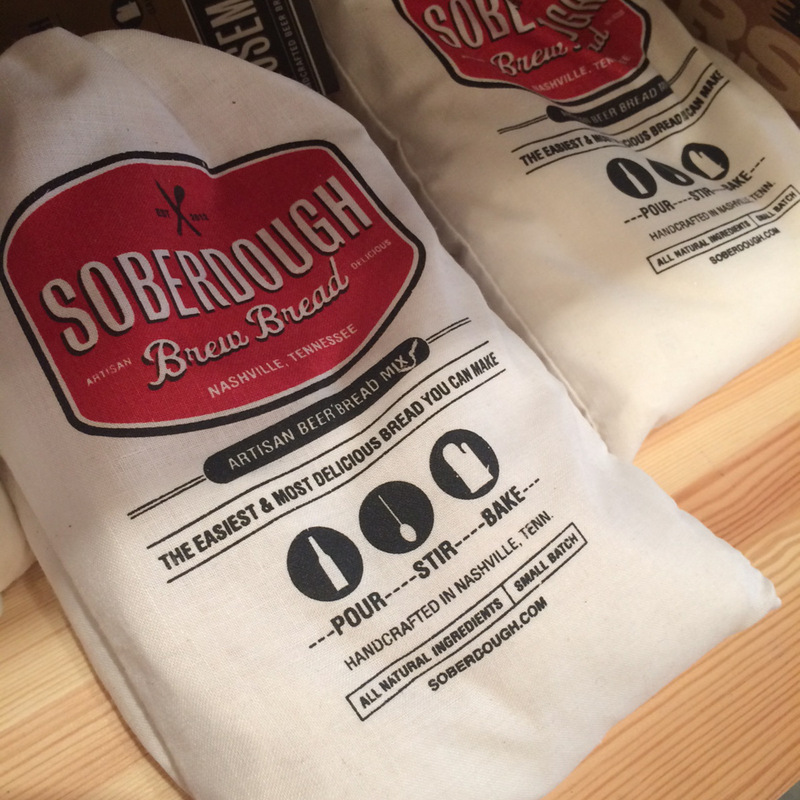 New Soberdough Brew Bread (yes, you read that right, add a can of beer to each recipe!) 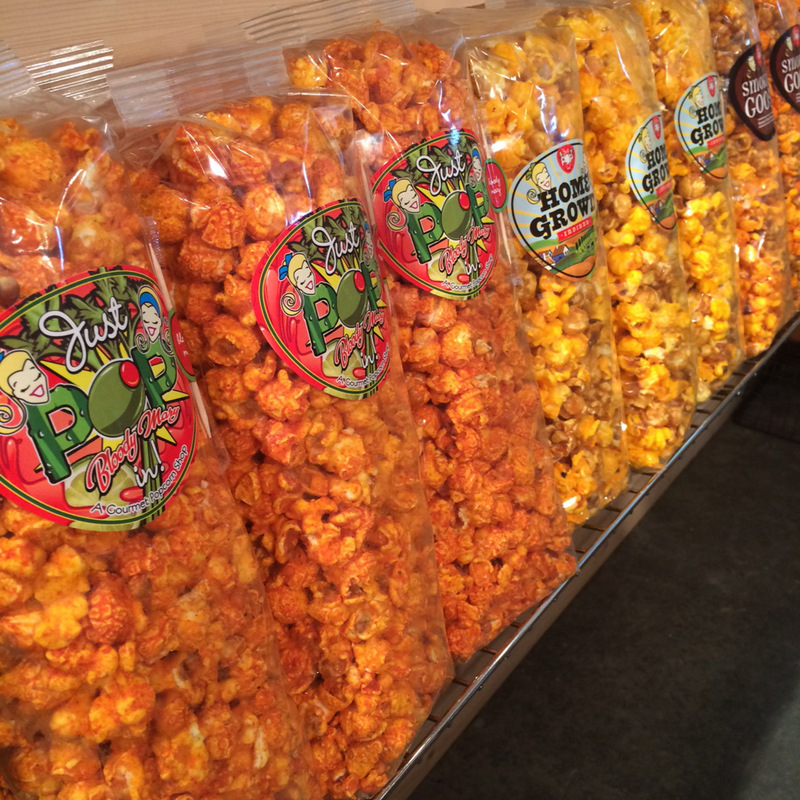 made in Nashville, TN in flavors like rosemary, roasted garlic, honey wheat, and classic; B. 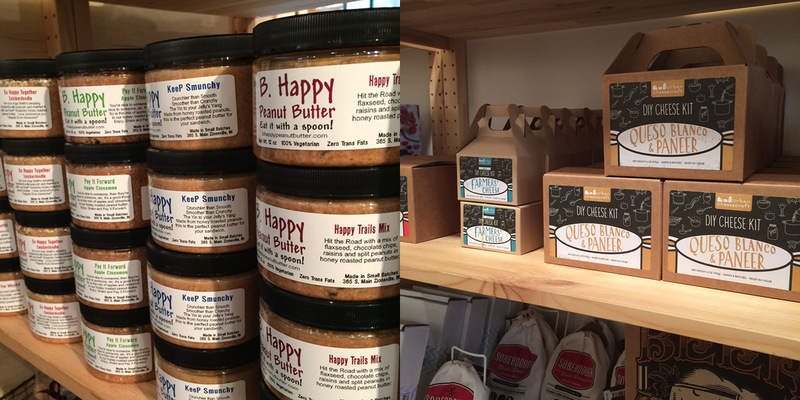 Happy Peanut Butter is back with a new flavor Pay It Forward apple cinnamon; and restock of Urban Cheesecraft’s DIY cheese kits. 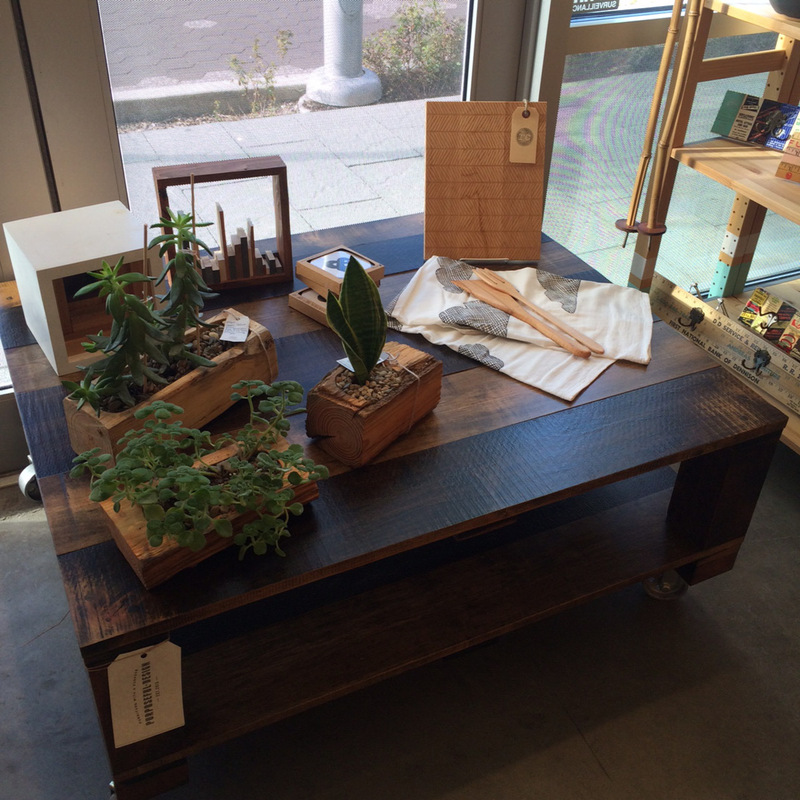 First Friday Celebration: Friday, October 2nd, 6-9pm: Every month, Homespun: Modern Handmade hosts a celebration in collaboration with iDADA’s First Friday events. Our shows change every other month with various artists showcasing work in painting, illustration, photography, ceramics, and so much more. 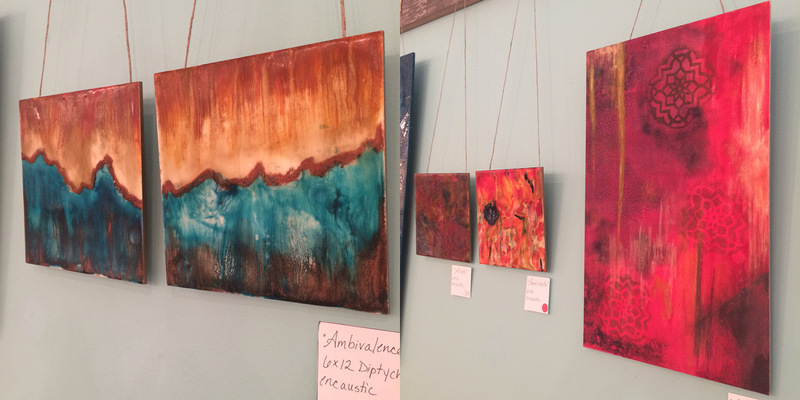 For the months of September and October, we’ll be featuring local artist Caryn Costlow’s work. A student at Herron School of Art and Design, Costlow’s encaustic paintings combine mixed media with abstract markings for a nearly three-dimensional effect; a nod to her background in sculpture. The event is FREE, refreshments will be served! 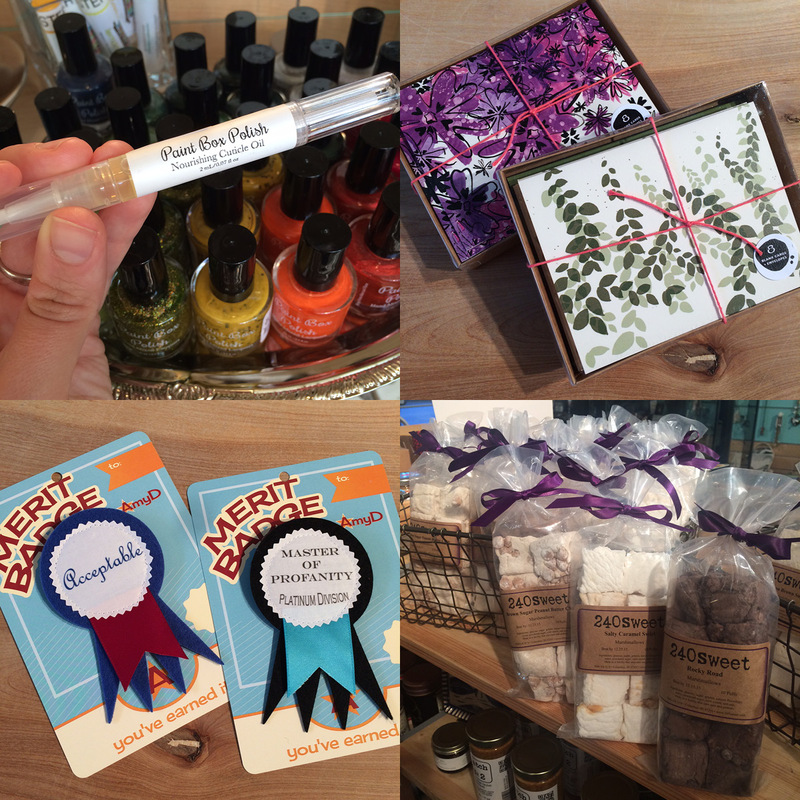 Holiday Candle Maker Pop-Up Bar w/ The Onyx Exchange: Sunday, November 8th, 11am-6pm: oin the Onyx Exchange for an afternoon of candle making at Homespun! Mark your calendars and stop in to make your very own 7oz. Lux candle or 10oz. Wine Bottle Candle. 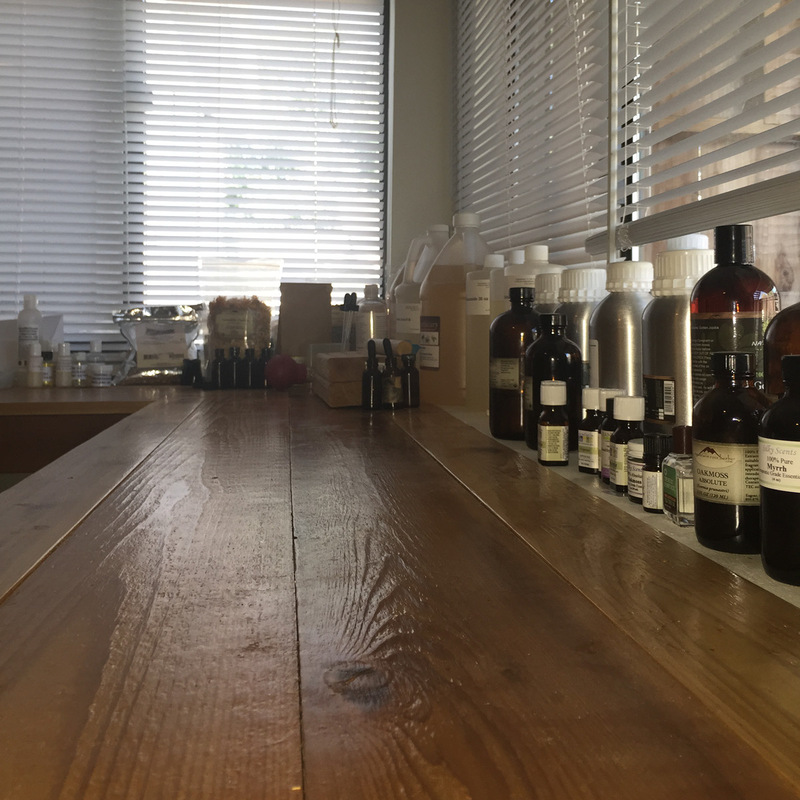 Mix your own scents (36 to choose from!) and create a one-of-a-kind candle. These make great holiday gifts! Now its OFFICIAL. Fall is here. Yes, I’m a pumpkin spice person and I don’t care who knows it and GIMMIE ALL THE PUMPKIN. Best Chocolate in Town have a pumpkin pie truffle. Black Market has a pumpkin ale. Get some real food in-between (or just leave it at that) at any of the fine restaurants around us and then stroll on down to Homespun, try on some of the softest scarves ever and revel in the fallness of it all. 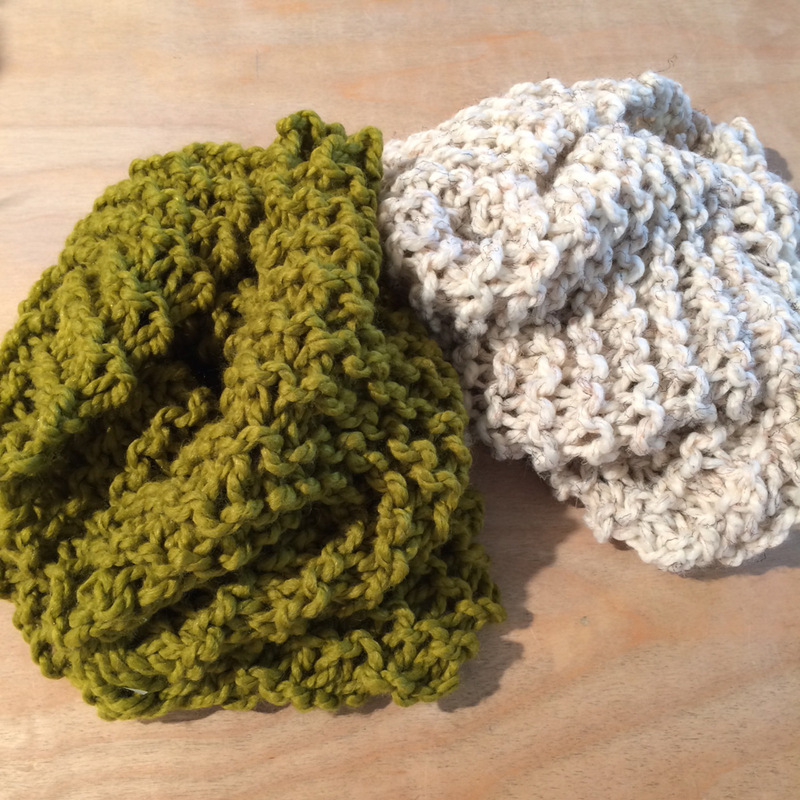 New, chunky infinity scarves from Jo Designs hand-knitted with love in Bloomington. They are so soft I want to be a warm little fuzzy kitten sleeping right in the middle of one. Or just, you know, wear it. As a person. Magnets from Indianapolis based Axler Works celebrating Indiana’s bi-centennial (bet you didn’t know we were coming up on 200 years!). Jo Designs has also sent us lovely dish clothes, face and dish scrubbies. Also re-stocked, now a Mom’s Choice Award winner, Let’s Change That children’s book by local Dr. Bashar Salame. Congratulations, you’re Acceptable! I crack up every time I see this and all the other hilarious merit badges by Amy D. Also new: Nourishing Cuticle Oil by Paint Box Polish in a handy dandy brush tube. Blank cards handmade in North Carolina by An Open Sketchbook Studio and 240Sweet re-stocked us with their delicious marshmallows including Brown Sugar Peanut Butter Chip. Hoooooly delicious. 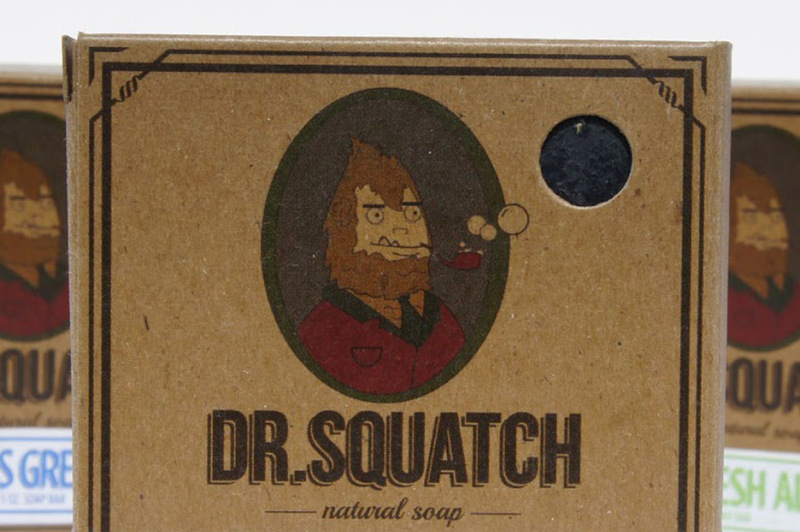 Meet Your Maker: Dr. Squatch Soap Co.
We caught up with AJ Fountain from Dr. Squach Soap Co., “a homegrown company that believes in trust and transparency, and like the great wild Sasquatch we believe in living a free, simple, and natural life. 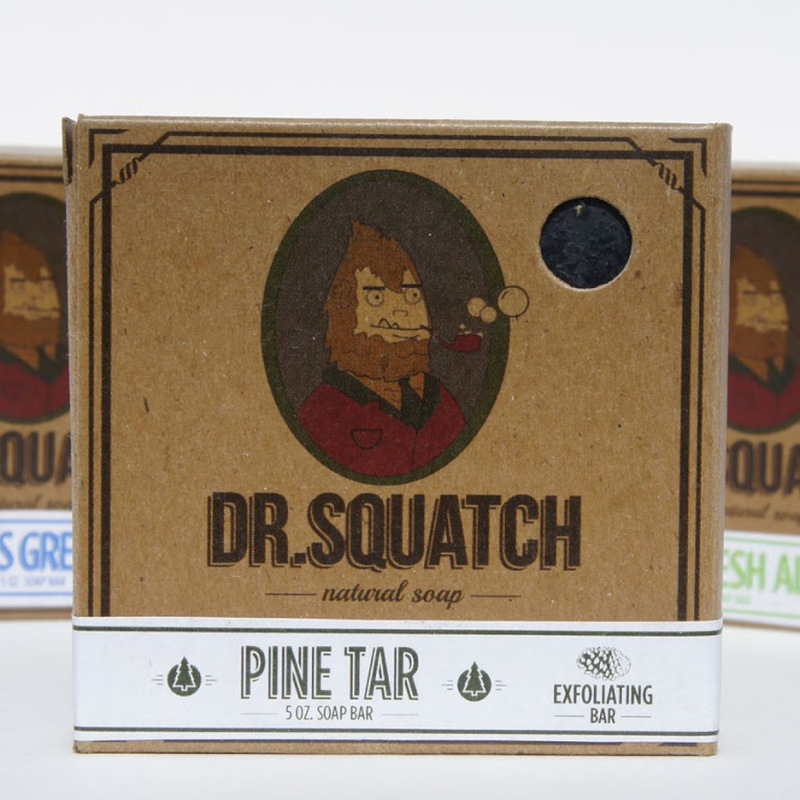 We have a deep admiration for being in nature, and we sought to bring this experience to other guys, even if its just in the shower.” I loved their positive attitudes and adventurous spirits, and even though I may not be “manly” and I just might prefer “glamping” I absolutely love these scents. 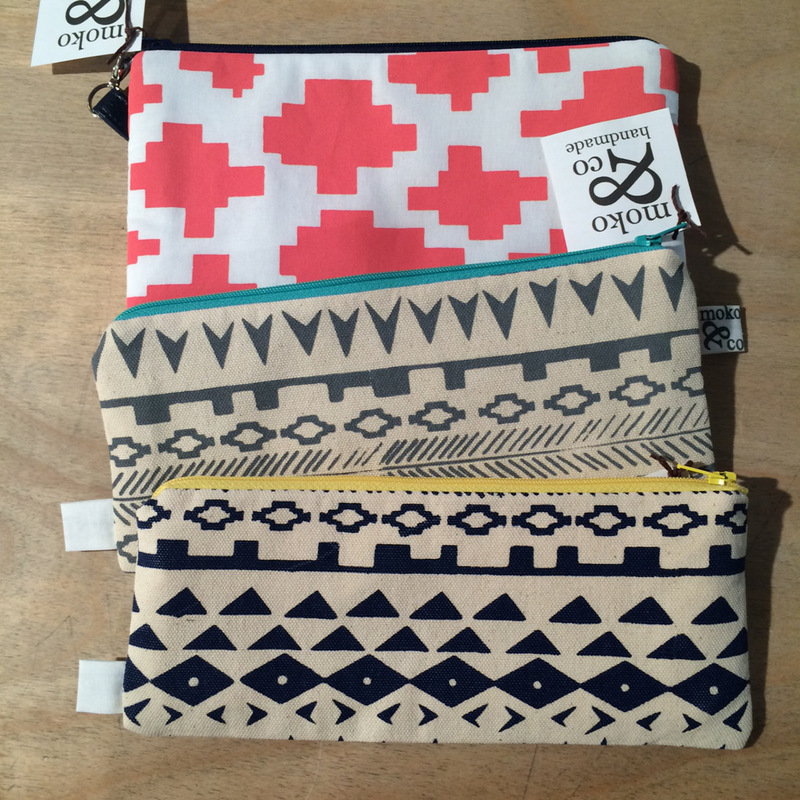 Check out their complete collection right here at Homespun. How do you describe your work to people who don’t know anything about handmade soaps? We started making because we believed in a better solution then what you can find at grocery stores, we kept making because it’s a blast. Collaborating with other small business to help each other. I always admired working artists, but the aha moment came when I tried that first batch of cold pressed soap we made. 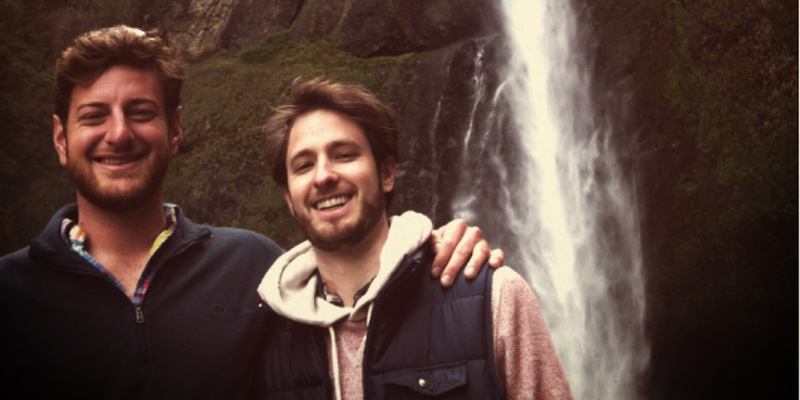 We work out of our homes in Carmel, Fort Collins and San Francisco. I would be Alexis Murdoch, a folk artist who I admire. The care, thought, and love put behind making it. I lived in Thailand for a while, I can balance a chair on my chin, and I can bend my finger back to touch the back of my hand. Give us three more non-crafting-related details about you or your life. 1. I’m an outdoor enthusiast and was an outdoor educator/guide for 5 years. 2. I play in a folk/reggae band called A Brother’s Fountain. 3. I live with my brothers who help in the business. You have a lot of good customer reviews. How do you hope your customers benefit from your product? My greatest hope is our product makes the shower and grooming experience a time you look forward to every day. 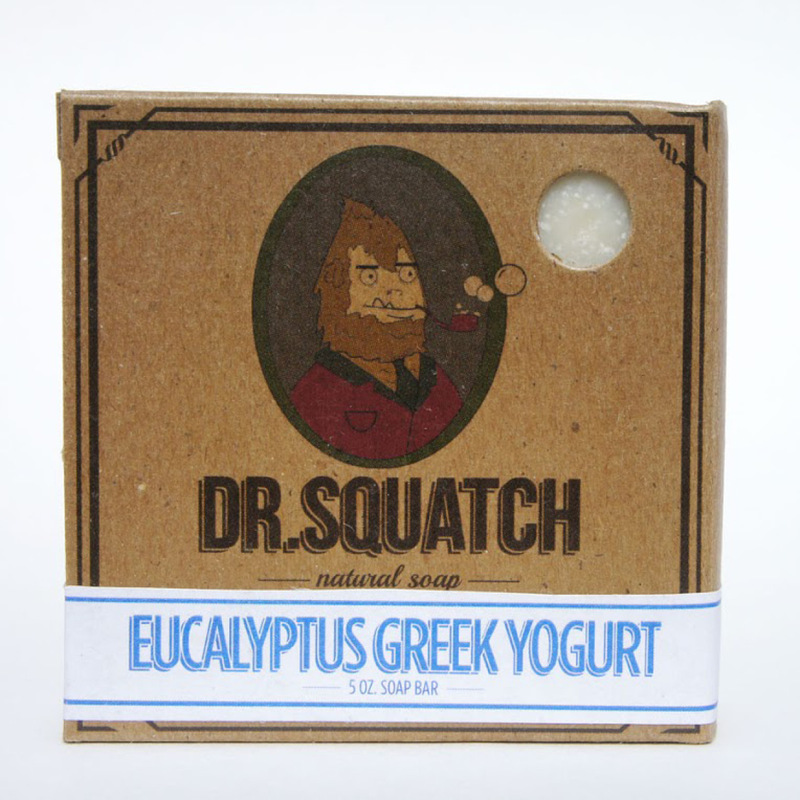 Scents are dreamed up a lot of ways, but our biggest inspiration is getting out to where they originate, the wilderness. 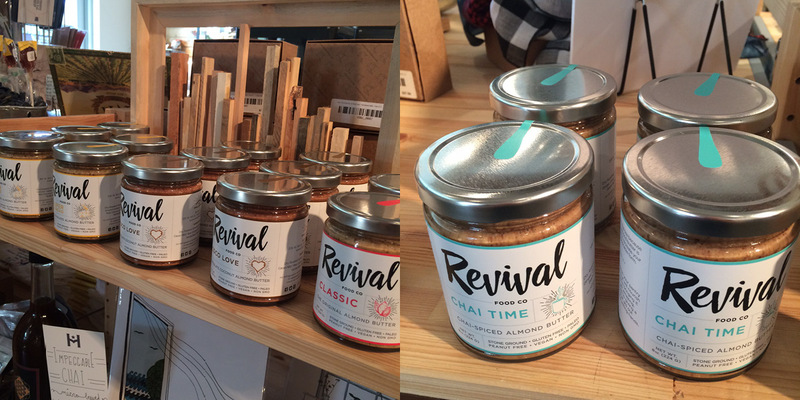 We believe strongly in the healing properties of ingredients from nature and we also believe strongly in the healing properties of spending time in nature, so we always try to get out there whenever we can and chalk it up as “R&D”. Right now you carry soap and cologne. Any new products on the horizon? We have loads of fantastic, natural, grooming products on the horizon. Our all-natural Clay Mint shave puck is coming out soon, complete with a copper mug and an uber soft brush. We’ve been working tirelessly for almost 2 years on our natural shampoo and conditioner and plan to have that out for our customers in September. Also, keep an eye out for a new, collaborative, seasonal soap scent over the holidays this winter. 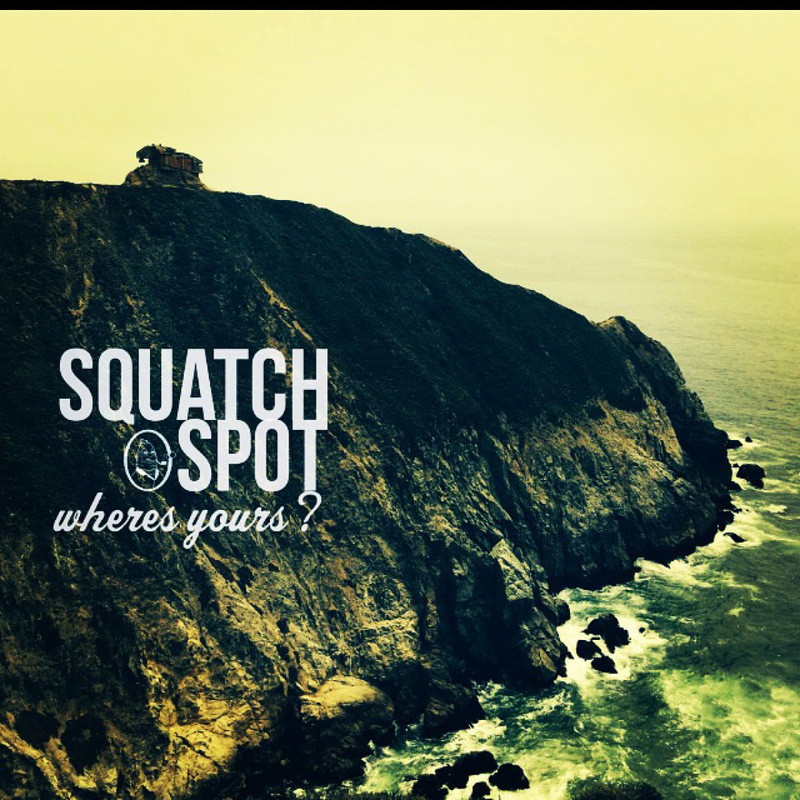 Have you ever seen a Sasquatch? 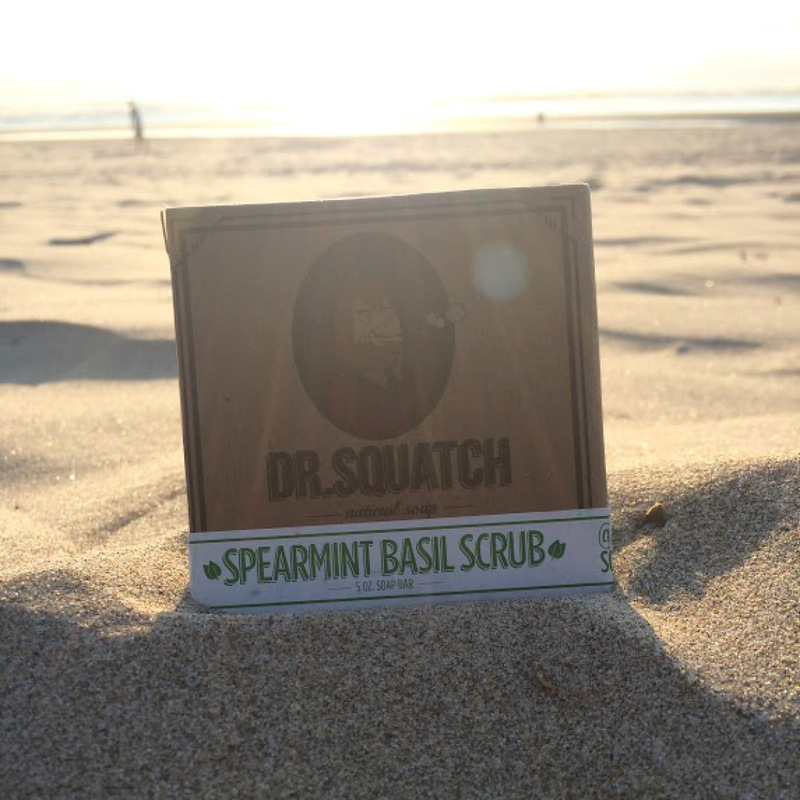 Check out Dr. Squatch at www.drsquatch.com, on Facebook at Dr. Squatch, and on Instagram, DrSquatchSoapCo. Thanks guys! 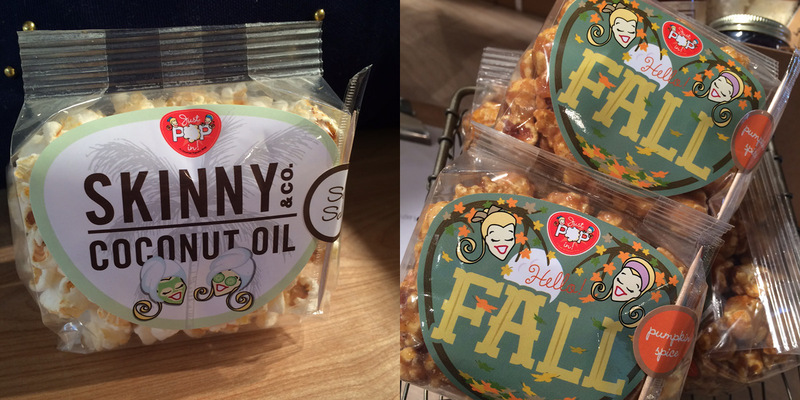 Only a few brand new goodies to show you this week, but a couple of them are perfect for fall, and we all know we can never have enough fall things in life. 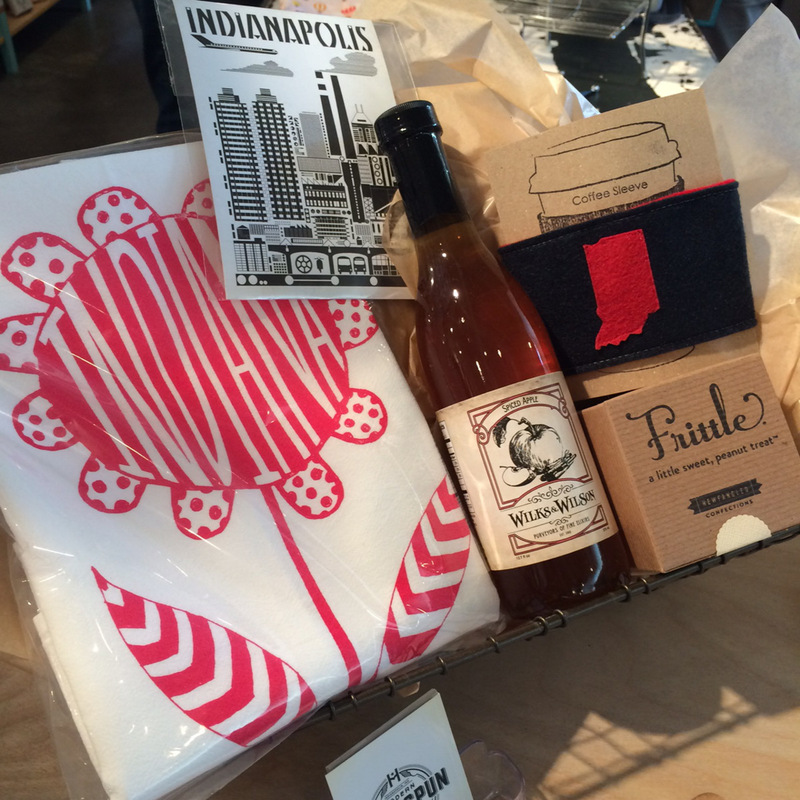 I spy, with my little eye, a bottle of Apple Spiced Syrup by local makers Wilks & Wilson in this new gift basket! Come get some of this and add whiskey to it RIGHT NOW! Or, make the best hot toddy you’ve ever had and cuddle up and bask in the glory of cool air (we’ll pretend like this mini-heat wave isn’t happening). 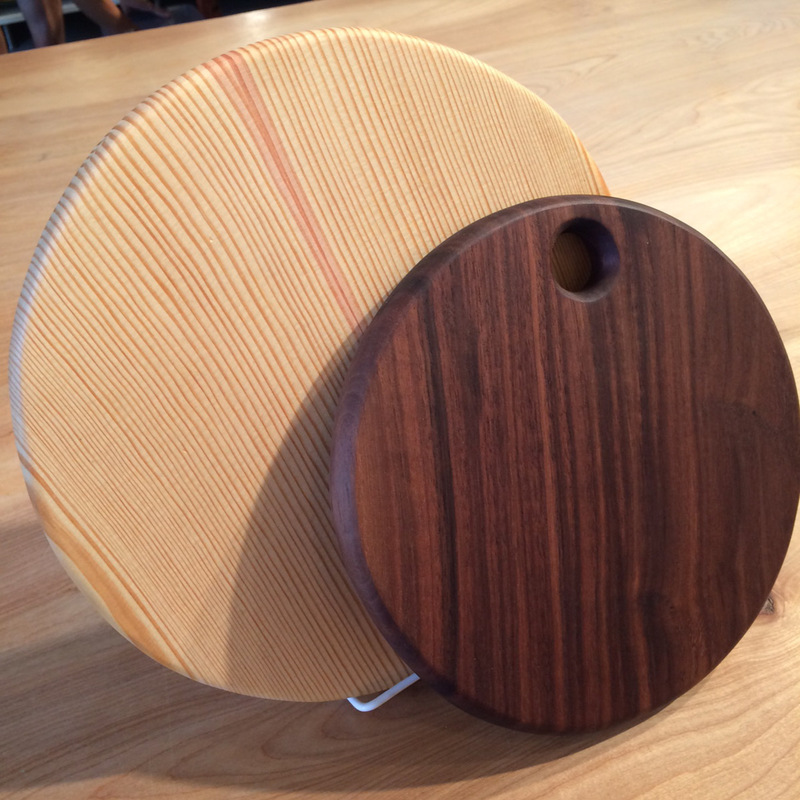 Host a party with these beautiful serving boards by Scrap Cycle, handmade in IN. Fabric earrings by Paula Routsong, nice new display for our Just Liv wire head wraps, screen-printed tea towels by Pine Street Makery (I’ve got my eye on those tomatoes), and a fun display of glass work: earring pairs, earring singles (mix & match!) and hair pins by Willow Stained Glass Studio and Krista Bermeo Studio, both Indiana artists. 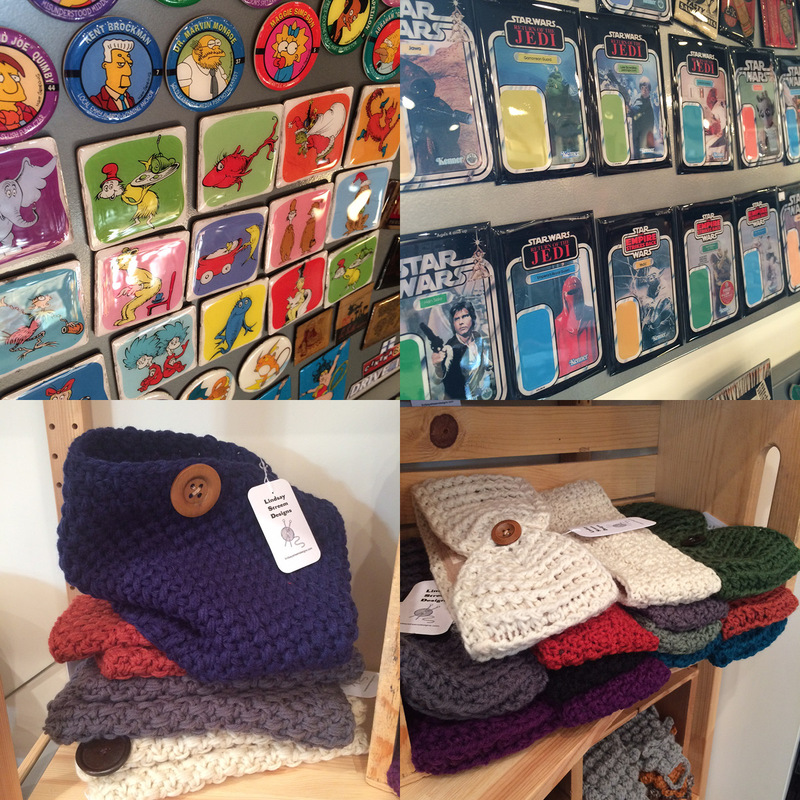 Joan of Dark left us with her wonderful books, Knits for Nerds and Geek Knits, and we have a brand new artist called Knits by Ed. He brought us these two beautiful pieces, a faux taxidermy bison and some beautiful red cardinals. They are so detailed and amazing, you’ve got to come see them in person! 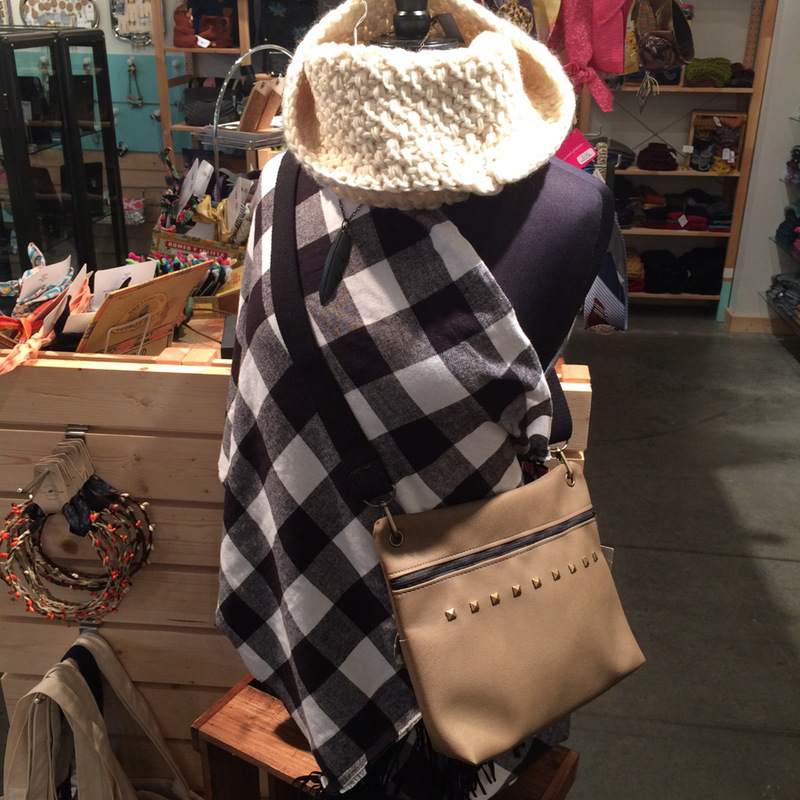 Also, our mannequin, always looking sharp in a hoodie by Scobar and fall necklace by Astronette. A homey little Homespun set-up on this coffee table by Purposeful Design. That’s THIS Saturday, folks! 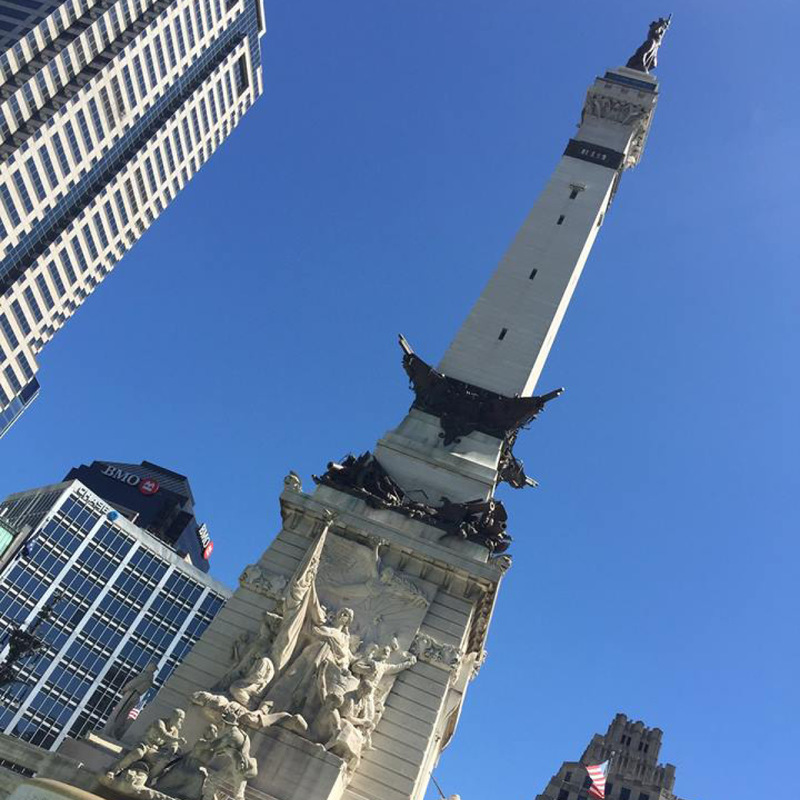 The INDIEana Handicraft Exchange is happening from 11am – 7pm on Monument Circle as part of Big Car Collaborative‘s Spark Monument Circle! We’re getting excited to see everyone! Come out for a beautiful fall day of handicrafts on the city’s most notable monument. This is a free, family-friendly event! Rocket 88 Doughnuts‘s doughnut/coffee cart will be on location from 11am – 2pm! Save room after breakfast for a delicious doughnut and wash it down with some of Mile Square Coffee Roastery‘s smooth cold brew. Yum! 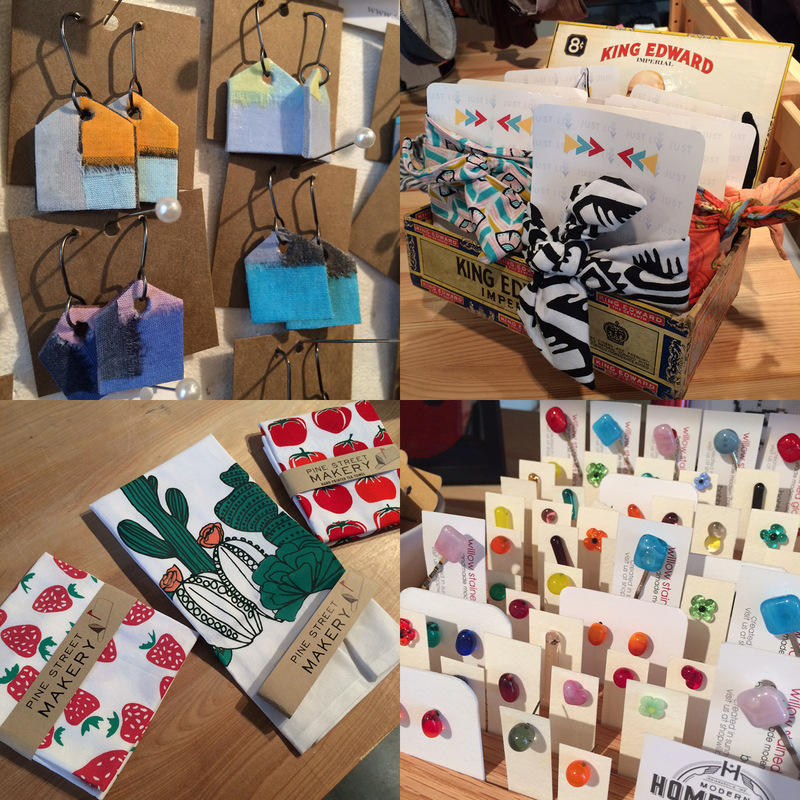 INDIEana Handicraft Exchange Mini: Saturday, September 19th, 11am-7pm: Located on monument circle downtown in collaboration with Big Car. Follow our IHE Facebook page for the latest. Art Squared: Saturday, September 19th, 12-6pm: Make art. Be art. Buy art. In Fountain Square. New month, new beauties on the sales floor. Welcome to September! Enamel earrings by Courtney Fischer of Royal Oak, MI, magnets from Mark Shirar of Fishers, IN, brand new vendor Lindsay Streem Designs of Wheaton, IL, and a beautiful new re-brand and re-stock from Revival Food Co. operating right here in Indianapolis. 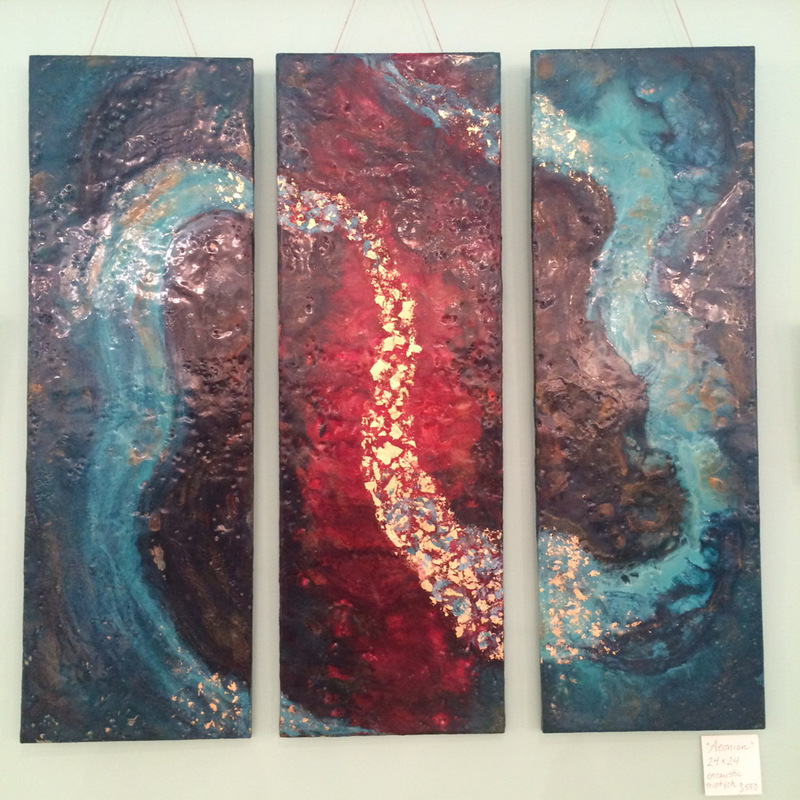 In our gallery now is some beautiful encaustic work by Indianapolis artist Caryn Costlow. 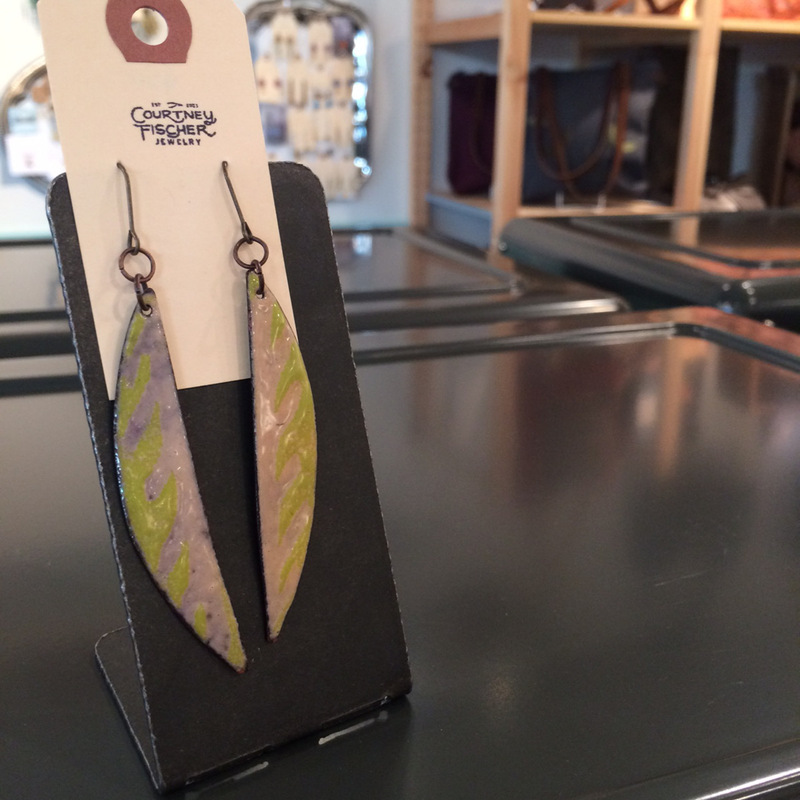 Take a look, right above our card section, for these colorful, stunning pieces. 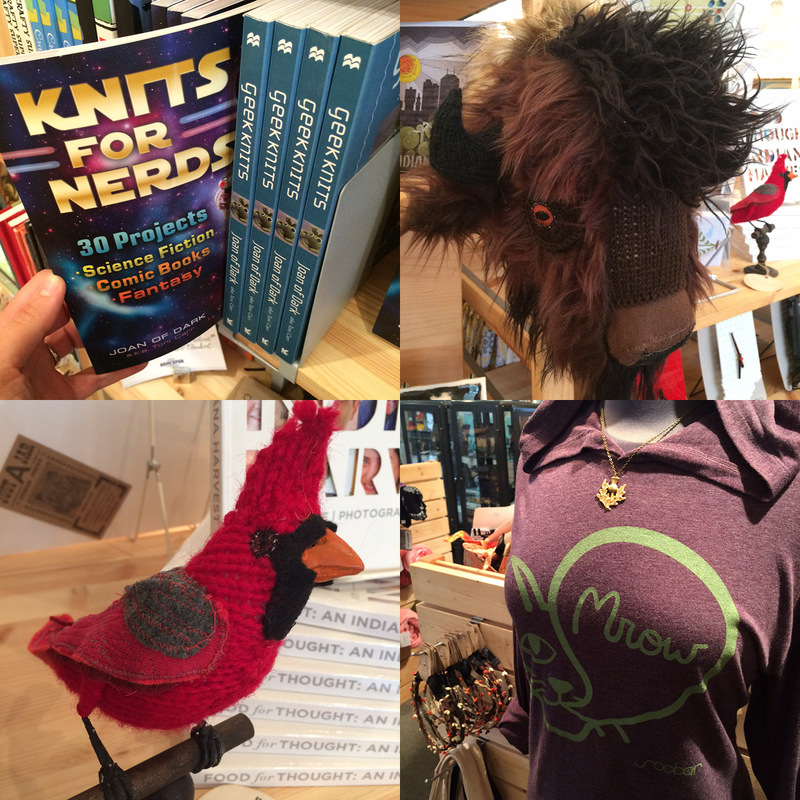 Join us THIS Thursday, September 10th from 6-8pm here at the shop and get your signed copy of Geek Knits! Joan of Dark is sometimes called Toni Carr, but not very often. Her passion for knitting started when she asked her grandmother to show her how, and she instantly regretted all the time in her life spent not knitting. Her first book, Knockdown Knits, was all about roller derby and knitting. Her second and third books, Knits for Nerds and Geek Knits, are both about nerdy/geeky knitting, so one could guess that Joan is a roller derby loving knitting nerd. This would be correct. 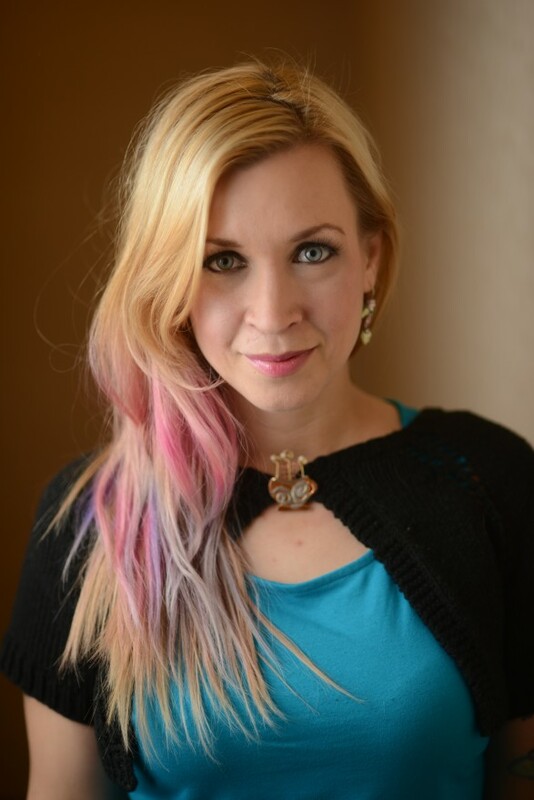 She is also a rescuer of animals, and surrounds herself with not only a very loving and tolerant husband, but a miniature horse named Starkey, Pigwidgeon (Widget) the parrot, a very weird dog named Sassy Burrito, Willie (the craziest corgi mutt ever), and a cat named Rori. 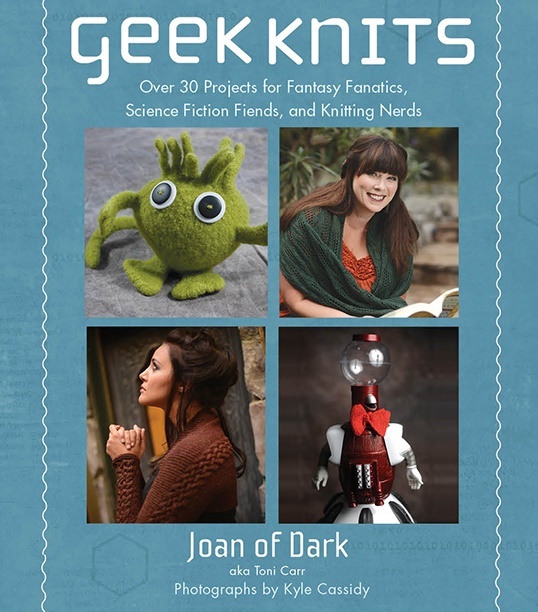 Geek Knits features patterns inspired by geek culture, with the knits modeled by some very familiar faces! Neil Gaiman in his Baker Street scarf and hat, George RR Martin cuddling a knit Direwolf, Adam Savage modeling a Muggle Artifact sweater and Whitney Avalon of “Princess Rap Battles” wearing a Captain America inspired sweater dress. Grab your needles and make a 20-sided dice for your home, a Bunnicula bunny too cute to be terrifying, or a Companion Scarf suitable for running away with a mad man and his blue box! 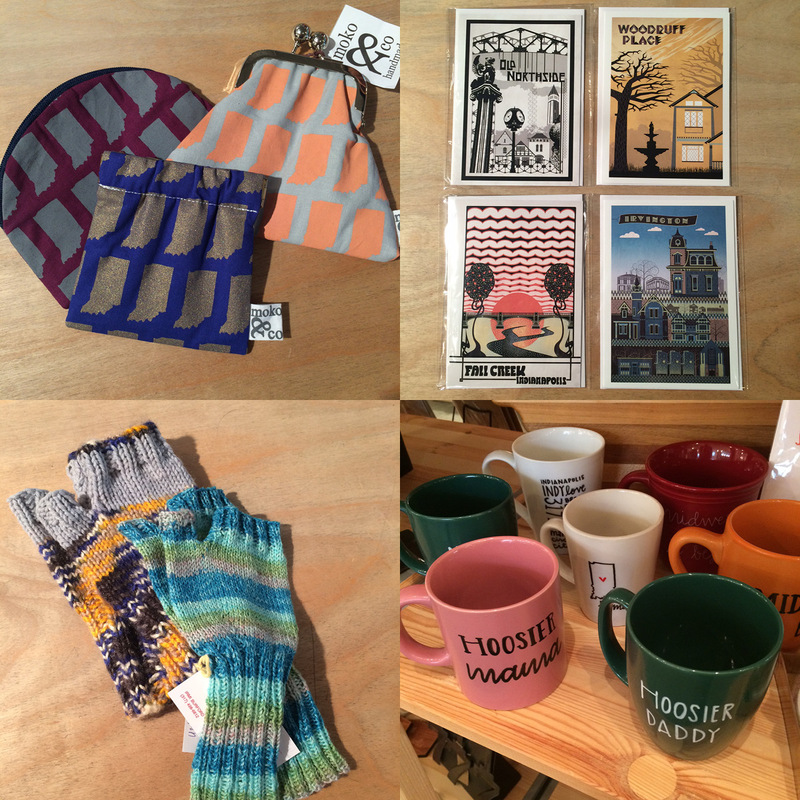 INDIEana Handicraft Exchange Mini: September 19th, 11am-7pm: Located on monument circle downtown in collaboration with Big Car. Follow our IHE Facebook page for the latest.